When she came by a few days ago, she brought a special treat — the sweater pictured here. It was the first sweater she ever made. It was 1961. She’d been knitting since she was 9; was at this point 16 years old and traveling in England; and she decided she needed to knit a sweater. It’s in amazingly good shape given its age — just a few spots that could use a little mending. I love the neck, in particular. But I am fascinated by the stitch pattern, and I can’t decipher it. It reminds me of all those wrapped stitch techniques I wrote about awhile back, but who knows. Do you know? I’m hoping someone can shed some light on this. And that you enjoy seeing it regardless. 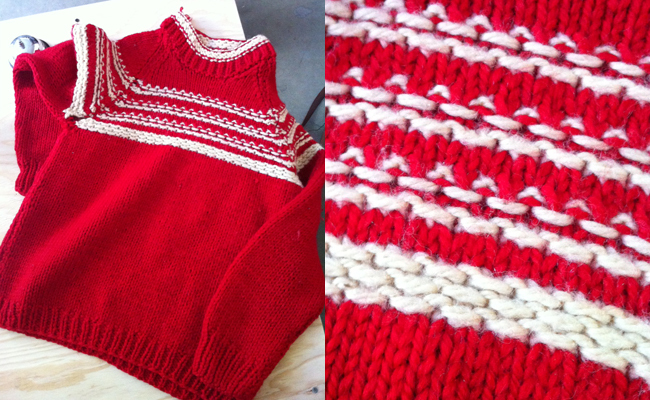 This entry was posted in Finds, Thoughts and tagged knitting, sweaters. Bookmark the permalink. Love the sweater! It looks like a slip stitch to me. A fast moving stitch with good looking results. It’s amazing Marion has kept the sweater. 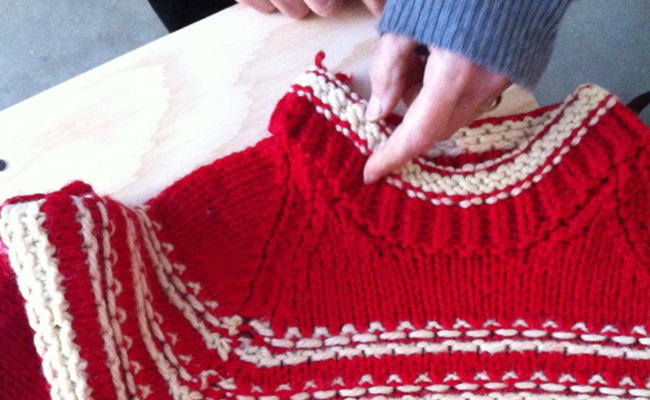 I can’t tell you how many times I have regretted not holding onto the sweaters my mom knit for me in the ’60’s. Meg has a aran style sweater that my sister knit for my mom and I snatched it up when mother was cleaning out her blanket chest where she stored her sweaters. It’s in amazing shape and my sister figures it’s about 50 years old! Marion ROCKS! I want to see her in that. Oh, I think you guys are right. Of course! It’s like the Honey Cowl. I should have recognized it. Thank you!